American Bandogge (Bandog) Dogs - The breed commonly accepted as the American Bandogge today was developed in the 1960's by an American veterinarian John Swinford, who set out to create a property guardian dog superior to all others. The American Bandogge is not recognized as a purebred dog. The widely accepted recipe for an American Bandog is usually 50% American Pit Bull Terrier and 50% Neapolitan Mastiff, although some breeders use other mastiffs as well, like the English Mastiffs, Bullmastiffs, Cane Corsos, Rottweilers, Japanese Tosas, American Bulldogs, Brazilian Filas and so on, as well as English Bullterriers, American Staffordhires, Irish Staffies and others for the bull-n-terrier part of the equation. This information is licensed under the GNU Free Documentation License. It uses material from the Bandog article on Wikipedia.org. 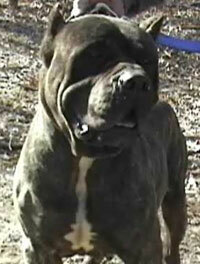 American Bandogge (Bandog) Breeders - Advertise your kennel puppies and dogs here.